SAINT AUGUSTINE – The Woman’s Exchange of St. Augustine will open reservations for its annual “Christmas in October” luncheons on Aug. 1, 10:30 a.m. The luncheons coincide with holiday shopping at the historic Peña-Peck House, 143 St. George St. The luncheon fee is $31.95, sales tax included, plus a $5 coupon off a $10 minimum purchase on the day of the luncheon. A luncheon includes an entrée, side dish, bread and dessert, plus coffee or tea, and water. A vegetarian option is offered but not vegan or gluten-free. Wine may be brought by patrons. Wine glasses are available on request. Patrons may make reservations in person starting at 10:30 a.m. on Aug. 1 paying by cash, check or credit card at the Woman’s Exchange. Phone reservations at (904) 829-5064 may be paid for by credit card when the reservation is made, or, by check sent within a week of the reservation (if the check is not received within a week, the reservation will be cancelled). Since 1932, the Woman’s Exchange has operated and managed the Peña-Peck House, circa 1750, on behalf of the City of St. Augustine. 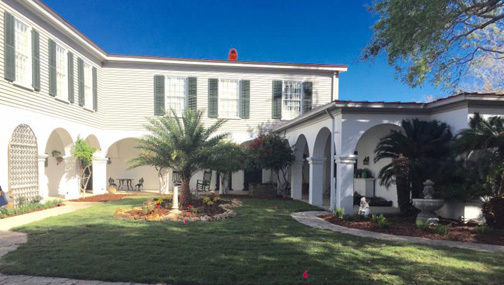 Proceeds from shop sales, luncheons and special events, and donations for daily tours benefit scholarships to St. Johns River State College for women over 30 returning to or, starting a career; helping consignors sell their hand-crafted items, and upkeep of the Peña-Peck House. Oct. 23 (Tuesday), Roast pork in prosciutto with chutney. Oct. 30 (Tuesday), entrée selection provided Aug. 1. Nov. 1 (Thursday), Chicken with wine and mushrooms. Nov. 13 (Tuesday), Baked chicken.